Babcock Power Environmental Inc., a Babcock Power Inc. company, signs Technology Collaboration Agreement with India’s major power generator, BHEL. 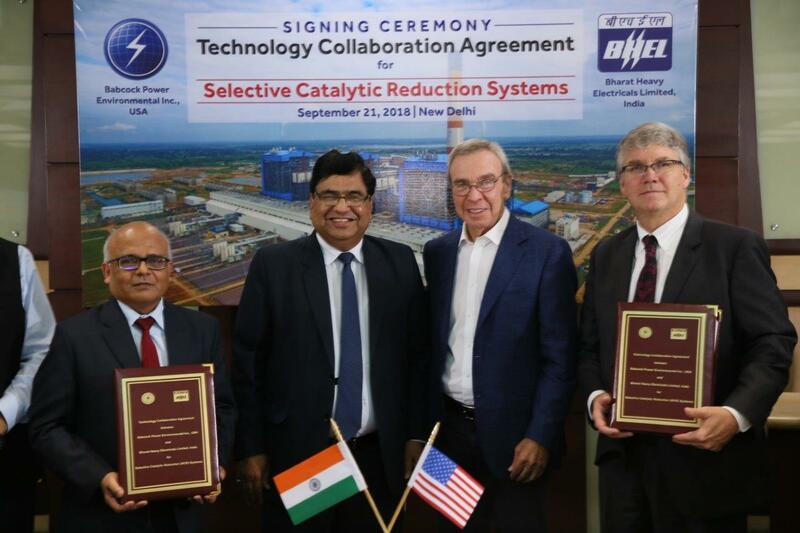 Chennai, Tamilnadu, India – Babcock Power Environmental Inc. (BPE) announced today that they have entered into a Technology Collaboration Agreement with Bharat Heavy Electricals Limited (BHEL), India’s leading power producer whose equipment account for over 60% of the power generated in India today. Babcock Power Environmental provides integrated products and services for air pollution control to power industries. BPE’s approach provides clients a single technology system for the removal of SO2, NOx, HC1, SO3, Hg and fine particulates. Babcock Power Environmental will provide Selective Catalytic Reduction (SCR) for De-NOx application to BHEL’s power equipment. Their state-of-the-art technology and air pollution control products will help provide effective emissions reduction to the people in India. With over 48,000 MW of SCRs in operation in the US, the largest share installed in the market, Babcock Power Environmental brings over 30 years of scrubber experience and is the undisputed leader in innovation and NOx control in the power industry. “With BPE’s impressive broad base of experience, innovative technology and reliable systems being integrated into our equipment, we are excited to see the successful results of our vision for cleaner air that helps to enrich the lives of the billion people living in India”, says Mr. Atul Sobti, CMD, BHEL.